[16x] HeartStone [WIP] Not So Big Update! *Added more colours to cobblestone! But still a great view from my end man. Hahaha, I might use that name if I don't get a better suggestion! Where the hell did this come from?!!? I haven't seen it at all until now and it's super duper awesome! I was wondering when you were going to FINALLY release a pack with some of the beautiful textures you've been making recently. Bout goddamn time! Since I love your stone textures I think the pack should be called Stone Heart or Stoneheart because for me, it's all based around the gorgeous stone textures. Great idea! I'm going to use that name, and thank you for the very kind compliments! The stone bricks are heavily inspired by your cobble. Got around to doing the rails. Well, they're as gorgeous as rails can be. Is there an ETA on a test release or something? I would really love to have a play with this. Not really sure, I'm glad you're looking forward to it. I've had some trouble before with converting to 1.6 format, some textures just don't work and show up as default. EDIT: Shoulda just checked the OP... Didn't use the unstitcher thing that you're using so I have no idea how it works/what doesn't work, etc. So yea, can't really help on that front, sorry! New furnaces and dropper stuff. This is looking great!! nice job. This is coming along very nicely, FishyMint! I'm looking forward to seeing it ingame. Thanks! I've finally got it to work ingame, so it might be available soon. I've been waiting to try it out for ages now! Will be nice to have another break from my pack again too so I can come back to it with a new perspective/hopefully new ideas. 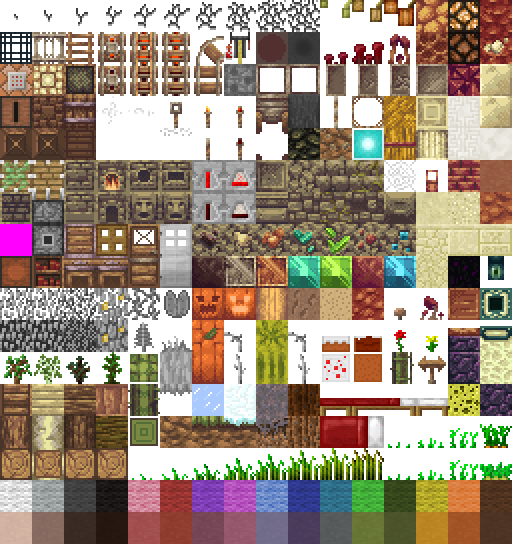 Hello, this is my work in progress pixel art texture/resource pack. I've been working on it for quite some time. Changes will be made, so most of the blocks are not the final product. If you are a member of the TAU, you might recognise some of the stone textures, I decided to use them in this pack. Changes will be made, so most of the blocks are not the final product. I want bucket loads of feedback and name suggestions! There's just nothing that I can say that hasn't already been said. This is gorgeous! Truly a shining example of great color selection mixed with outstanding pixel art. Yes. Do want. DO WANT!!! +Tilled soil or whatever it's called! And soulsand will be fixed for the next update, because it looks horrible. Seriously though, can't wait to play with it. Everything is so rough and lovely!